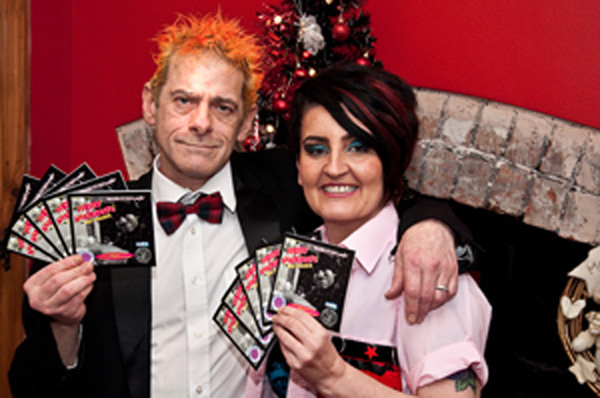 NORTH-EAST PUNKS HELP THE HOMELESS! Punks from the North-East of England have come together to record a fundraising single for the homeless. The cover of the RALPH McTELL and ANTI-NOWHERE LEAGUE standard ‘Streets Of London’ – relocated on this occasion to Newcastle – was the brainchild of punk couple Tony and Karen Houghton of the band PRETTY ANARCHISTS. They called on members of other punk bands from the region, as well as studios and local service providers, who were only too happy to get involved. Funds raised by sales of the single will go to Newcastle homeless charity The People’s Kitchen. Recorded at Shagnut Studios in Billingham and BoomChang Records in Newcastle, punks who took part in the sessions included members of LOGOZ from Ashington, Tyneside band THE Vs, Billingham-based ZEITGEIST 77, Sunderland’s SPITFIRE BULLETS, Gateshead-based THE BAND FOR DISEASE CONTROL AND PREVENTION and Cramlington’s ALL OUT ATTACK. The 3-track CD is available from the bands, local record shops and from their JustGiving page. ‹ ALICE COOPER ANNOUNCES U.K. SHOWS!